Did you miss the National CDSME & Falls Prevention Resource Centers’ Annual Meeting? Falls Prevention Awareness Day (FPAD) 2016 was our biggest ever! With your help, we created national awareness through media efforts, education, risk screenings, and advocacy activities, plus referrals to community-based falls prevention programs. Read our summary of 2016 activities to get ideas for FPAD 2017! The Senate bill to repeal and replace the Affordable Care Act (ACA) was released today. It includes significant cuts to Medicaid and would eliminate the Prevention and Public Health Fund at the start of FY18 on October 1, 2017. This fund invests in falls prevention and Chronic Disease Self-Management Education (CDSME) across the country. Look for the next issue of NCOA Week on June 27 for more details and analysis. CDSME programs are evidence-based to improve health outcomes and save health care dollars. We’ve created a new video to help you communicate with health care organizations about the many benefits of referring patients to participate in CDSME workshops. 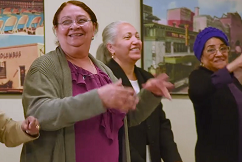 NCOA extends special appreciation to the Healthy Living Center of Excellence, Elder Services of the Merrimack Valley, their participants and health care partners, and Kate Lorig, for their significant contributions and partnership in producing this video. One reason clinicians fail to conduct falls risk assessments is they lack dedicated Current Procedural Terminology (CPT) codes for assessment services. However, providers can counsel patients regarding falls risk using existing Evaluation and Management CPT codes. This new CPT code flyer, developed in collaboration with the Centers for Disease Control and Prevention (CDC) and the American College of Preventive Medicine, provides detail on falls-related quality indicators and which codes to use for falls assessment and intervention. The number of state and federal prisoners aged 65+ grew at a rate of 94 times the overall prison population from 2007-2010. 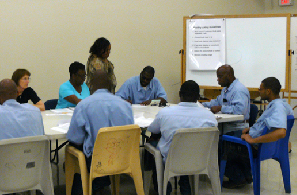 It’s important to support healthy aging among prisoners to prevent the need for increased medical intervention while in prison and to ensure a smooth transition upon release. Explore this tip sheet for strategies to partner with correctional facilities to implement evidence-based programs and examples of partnerships across the U.S.
Visit the NCOA website to check out the presentation slides from sessions focused on a variety of topics, including marketing and recruitment, network hub development, partnering with health care entities, participant engagement, and sustainability. Recordings of select sessions will be posted soon! The Senate Finance Committee held a hearing in May on S. 870, the Creating High-Quality Results and Outcomes Necessary to Improve Chronic (CHRONIC) Care Act. NCOA advocated for improvements to the bill and worked with the Diabetes Advocacy Alliance to submit a letter to the Senate Finance Committee, which urged the committee to include provisions in the CHRONIC Care Act focused on increasing Diabetes Self-Management Training utilization. June is Pride Month and community organizations have a large role to play in making our communities more inclusive for LGBT individuals. Read our latest blog posts about 5 steps to make your organization more LGBT inclusive and actions that you can take to prevent or manage cancer, behavioral health issues, and cardiovascular diseases. A new website from the Administration for Community Living features a searchable database of nearly 200 community-based oral health programs for seniors, plus resources to start your own. More than 5 million Americans are living with Alzheimer’s disease, the most common form of dementia. Alzheimer’s is the 6th leading cause of death in the U.S. Research has suggested that combining good nutrition with physical exercise, cognitive activity, and social engagement can reduce or slow the risk of cognitive decline. Educate older adults about lifestyle habits they can adopt to keep their brain healthy and potentially reduce their risk of cognitive decline. Grant to improve services for individuals with developmental disabilities: View this funding opportunity announcement from the Administration for Community Living to test new coordinated approaches to providing home and community-based services. Grants to improve emergency preparedness: Read more about the Department of Homeland Security’s funding opportunities to improve the nation’s readiness in preventing, responding to, and recovering from emergencies. IAGG 2017 session: Innovation in Health Care Delivery for Adults Aging with Disabilities: Join a panel of experts to learn more about current findings on innovative models of care coordination and evidence-based programs. July 23 @ 9-10:30 a.m. PT in San Francisco, CA. Overcoming obstacles to policies for preventing falls: Read this new report from the U.S. Department of Housing and Urban Development on strategies for preventing falls among older adults. Download the updated Get Connected toolkit: Explore the Substance Abuse and Mental Health Services Administration’s updated toolkit to link older adults to medication, alcohol, and mental health resources. Learn the difference between dementia and Alzheimer’s: Read NCOA’s blog post to increase understanding of dementia, alleviate stigma around dementia-related illnesses, and increase support for individuals living with them. Hear Dr. Kate Lorig’s perspective on evaluating the outcomes of evidence-based programs: Read this blog post from the Aging and Disability Business Institute on strategies for determining when and how you should measure program outcomes. Learn more about diabetes in your state: View the CDC’s Diabetes State Burden Toolkit for local information on the impact of diabetes on health, economics, and mortality. Explore tools for safe medication management: Check out the Be Medwise website for information on maximizing the benefits and preventing the risks of medications.